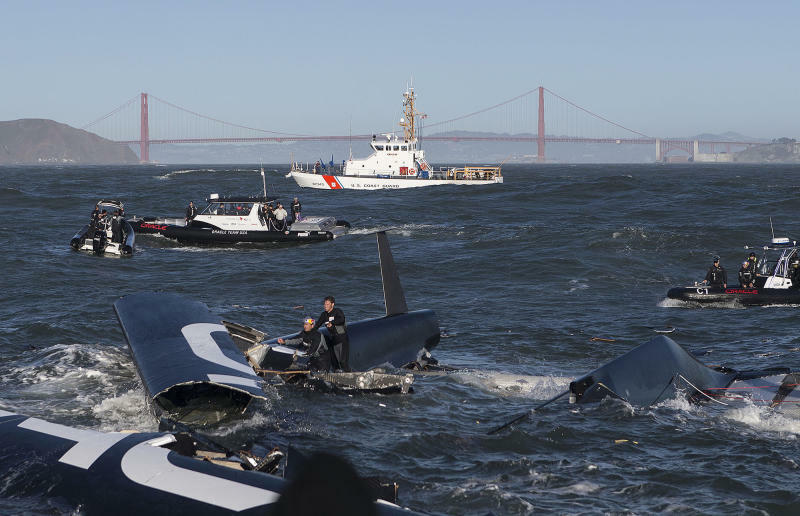 As the hulls of his 72-foot catamaran dug into the waves on San Francisco Bay and the boat began to tumble stern over bow, America's Cup champion Jimmy Spithill of Oracle Racing thought only about his mates and how they'd come out of the scary crash. Spithill had capsized a 45-foot version of the fast catamaran before, but the 72-footer that flipped Tuesday is more powerful and carries a bigger crew. "You're a lot higher in the air," Spithill told The Associated Press by phone on Wednesday. "You're 70 feet in the air. My biggest concern is there are a lot more of your teammates on board. And really, until you know everyone is accounted for and safe, that's probably the worst part of the experience. "There were some cuts and bruises, but it was pretty amazing everyone was able to walk away from it," Spithill said. "There were no significant injuries. It's very, very fortunate to get through that and to get the boat back in one piece. Things could have been a lot worse considering the conditions last night." The boat, being tested for the 34th America's Cup next year, carried 11 crewmen, a designer and two extra sailors. All were wearing crash helmets and life vests. "The last thing I heard before we went over, and it became evident we were going to go over, was Jimmy yelling out, 'Make sure you have an eye on your mates,' said Jono MacBeth, a grinder. Most of the crew rode out the capsize in the cockpit in one hull, but two of them had to cling to the net that forms a platform between the two hulls. Eventually, everyone had to jump into the cold water to get clear of the boat. The boat pitch-poled, or tumbled end-over-end. It's typically the scariest way a multihull can wipe out. It took several hours for the syndicate to bring the boat to shore after it was swept by a strong ebb tide more than four miles past the Golden Gate Bridge. The boat turned upside down and was towed that way back to the team's base at Pier 80, arriving about 1 a.m. PDT. Spithill said the boat appears to be in relatively good shape considering what it went through. The boat was lifted out of the water Wednesday afternoon and the shore crew was going to wheel it into a shed to assess the damage. Initial reports said the 131-foot wing sail was destroyed. Spithill said it was badly damaged but thinks it can be fixed. He said the syndicate was still recovering pieces of the high-tech wing on Wednesday. 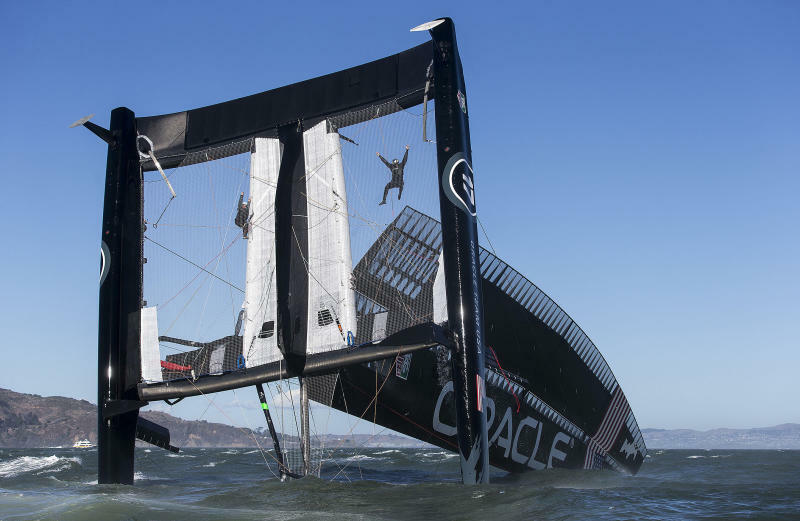 Oracle Racing is owned by software billionaire Larry Ellison, the head of Oracle Corp.
Only a handful of syndicates have begun testing the 72-footers, which cost between $8 million and $10 million. This was the first capsize. "It was always a possibility. I really hoped that it wouldn't happen," said Spithill, an Australian who at age 30 in 2010 became the youngest skipper to win the America's Cup. "However, the most important thing is everyone is safe and sound and we got the boat and components back to shore. Now we have to learn from it. No doubt it's a setback in our program, but there is no doubt the team will bounce back from it and not let it affect us. We can still go out there and defend the Cup for the United States." Spithill doesn't think the 72s are dangerous. "Just like race cars, you're always going to be pushing," he said. "That's part of the game, is managing the risk." The crash happened as the crew was turning away from the wind, which was blowing at about 25 knots. Spithill said the crew had performed the same maneuver four times earlier Tuesday. He said the crew will study video and photos of the crash to figure out what went wrong. Oracle is building another 72-footer due to be launched early next year. Spithill said Tuesday's crash could keep the team from two-boat testing. Oracle has bounced back from mishaps before. 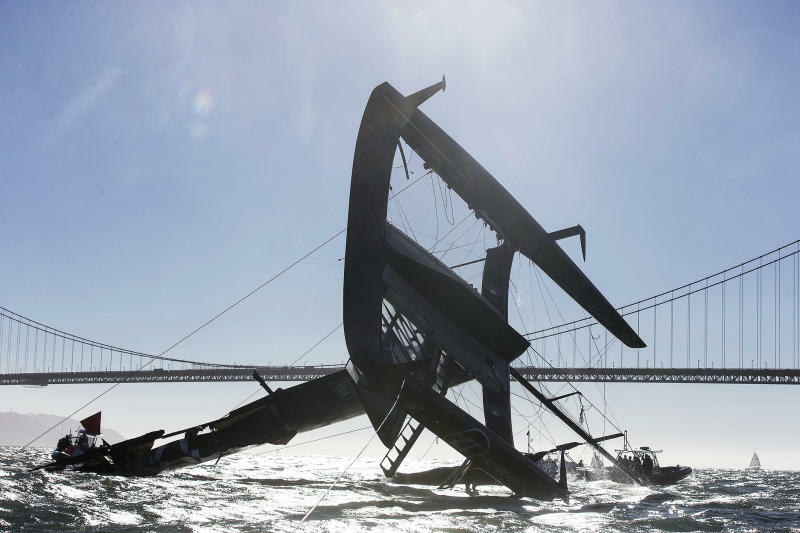 In November 2009, while the syndicate was testing its giant trimaran off San Diego, the 200-foot carbon fiber mast came crashing down and snapped in two as it hit the rear beam. Shortly after that, the team replaced its traditional soft-sail rigging with a radical, 223-foot wing sail which was the key factor in Oracle sailing's two-race sweep of Alinghi of Switzerland in February 2010 to bring the oldest trophy in sports to San Francisco. In an effort to make the America's Cup more fan friendly, Oracle Racing ditched the sloops that had been used since 1992 and replaced them with faster catamarans, which fly a hull out as they speed through the waves. The Louis Vuitton Cup for challengers will be held on San Francisco Bay from July 4 through Sept. 1, 2013. The winner takes on Oracle Racing for the America's Cup from Sept. 7-22.